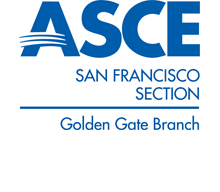 Welcome to the San Francisco Golden Gate Branch of the San Francisco Section of the American Society of Civil Engineers (ASCE)! The Golden Gate Branch has many active members throughout the Bay Area and hosts regular meetings, technical and professional presentations, and networking events, as well as provides opportunities for leadership development and community outreach. The Branch holds regular monthly dinner meetings, which provides its members an opportunity to network with public and private sector engineers from around the Bay Area. Our meetings are usually on the 3rd Thursday of each month and typically alternates between San Francisco and Oakland to focus on projects across the region. We also regularly host joint meetings with the ASCE Technical Institutes. Please join our email mailing list to receive our monthly meeting invite! The 2018-2019 Executive Board is looking forward to serving our membership and expanding the Branch's reach and community involvement over the next year! Please feel free to reach out to us if you have any suggestions and/or questions regarding ASCE. To receive our monthly dinner meetings, as well as important Branch news and updates, please subscribe to our Branch Mailing List! Golden Gate Branch will have a dinner presentation at Peony Seafood Restaurant in Oakland. The evening topic will be the rescue by structural engineers of damaged Concrete Silos. The speaker will be Dr. Fari Bazegar of Habitat Engineering. Shortly after construction and commencement of operations, two (2) attached concrete cylindrical silos (140-ft tall, 54-ft diameter) experienced significant cracking and water intrusion damage. This prompted a series of forensic investigations by various parties involved. The presentation will address several phases of the investigation including field observations & documentation of as-built conditions, review of engineering design and construction documentation, consideration of auxiliary attachments to concrete shells, grain loading/withdrawal operations, expected structural behavior in service, and identification of possible cause(s) of damage including foundation settlement. Dr. Fari Barzegar is the founding principal of Habitat Engineering & Forensics, Inc. He holds a B.S., M.S., and Ph.D. in civil/structural engineering from the University of Illinois at Urbana-Champaign. Fari has over 32-years of experience in engineering and forensic consulting, structural design, construction project management, university teaching and research. He has special expertise in concrete/shotcrete/masonry structures/foundations, seismic and blast-resistant design, structural dynamics and finite element analysis method. He has provided a broad range of consulting and expert-witness services encompassing buildings and components, bridges, industrial installations, underground tunnels, caves and conduits, and investigation of unintended damage and accidents during construction and demolition (conventional and/or using explosives).